This book shows why political theorists must take account of ecological concerns as part of their core enterprise, and how they can do so. It mounts a challenge to the received wisdom, of political theorists and their ecological critics alike, that specifically ecological values go against human interests. In Part I, Hayward criticizes those accounts of ecological values which appeal to nature's 'intrinsic value' or advocate a 'non-anthropolocentric' ethic. Such appeals are bound to fail, he argues, not because their moral impulse is too demanding but because 'values' unrelated to human interests are conceptually incoherent. Insisting on them is politically counterproductive. Part II reveals how it is actually in humans' interests to integrate ecological concern into political institutions and policies. Following a nuanced discussion of 'self-interest', Hayward goes on to show how some ecological problems can be solved by harnessing humans' rational self-interest to market-based and fiscal policies, and others by using more enlightened interests in the provision of social goods. The argument regarding ecological problems that affect non-humans more directly than humans is that humans have an interest in self-respect and integrity which provides reasons to respect non-human beings and their environmental interests. 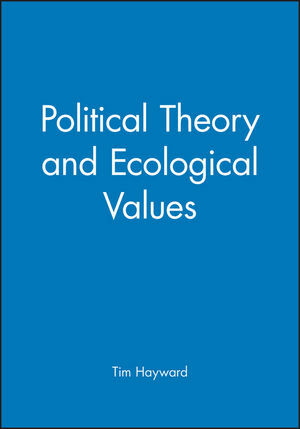 The concluding chapter indicates how the articulation of ecological values in terms of interests makes it possible to integrate them into a political theory of basic social institutions. This book will be of interest to students and scholars in political theory and environmental studies. Tim Hayward is a Senior Lecturer in the Department of Politics at the University of Edinburgh. 1. Ecological Values and Human Interests. Part I: Critique: Two Dogmas of Ecologism:. 2. Intrinsic Value in Nature: Analysis and Critique of a Misleading Idea. 3. Anthropocentrism: A Misunderstood Problem. Part II: Reconstruction: Human Interests and Ecological Values:. 4. The Enlightenment of Self-Interest. 5. Human Interests and Environmental Values. 6. Human Self-respect and Respect for Nonhumans. 7. Political Theory for a Sustainable Polity. * An original contribution to political theory and environmental politics. * Critically evaluates existing ecological and political theories and offers a new approach for how political theory can take account of environmental issues. * Demonstrates why and how political theorists should take account of ecological concerns.